55 Defense Safety Shot drills guaranteed to increase getting you ball-in-hand by 100%. Control your opponent and the table by seeing defensive opportunities you're currently overlooking. Increase your winning averages. 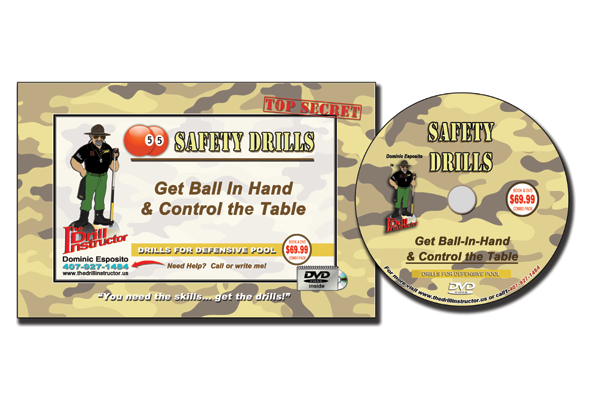 Watch each Safety Drill on this 2-hour DVD. Listen as The Drill Instructor explains techniques, strategies, and various nuances. Each safety drill is shot 3 times: See a picture-in-picture view, revealing the shooter's perspective and an overview of the table layout. Second, the shot is analyzed in slow motion showing pinpoint cue ball accuracy for executing the safety play. Then re-watch the shot in real time with reinforced strategic commentary.